Facebook launched a new feature this week called Friendship Pages. 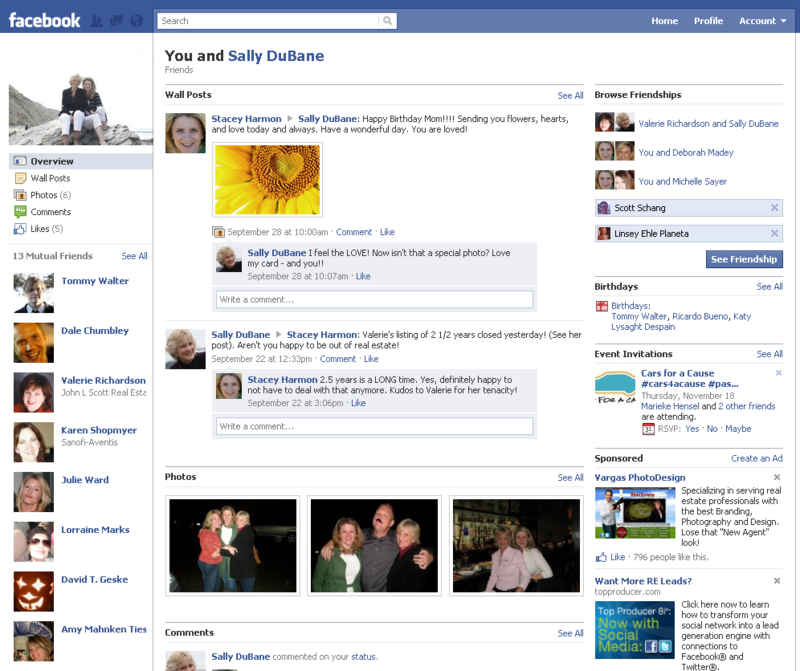 Friendship pages chronicles the Facebook history between two Facebook friends. On the friendship page between you and any of your Facebook friends, you will see wall conversations between the two of you, photos that you both have been tagged in, mutual friends, and mutual pages that you like. 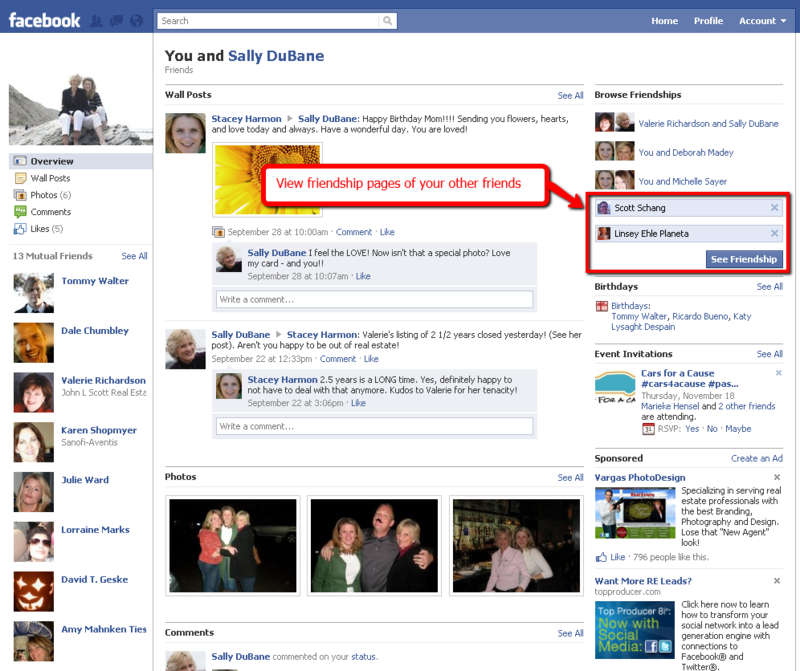 You can also view friendship pages between any two of your Facebook friends. In addition, Pixel Coaching has noticed that, depending on the privacy settings of users who are one degree away from you (meaning you have a mutual friend, but you aren't Facebook friends), you can view friendship pages between your mutual friend and them (if this didn't quite make sense, see the screen shot below for further clarification). What ways do you see this new feature helpful to real estate agents for business development? They certainly seem to hold good promise for social farmers. The best initial idea that Pixel Coaching sees is using the friendship page as a resource for getting a conversation started. Sometimes all salespeople need is a conversation starter. Friendship pages make it simpler to find a relevant topic that you have already shared. It's a little like a walk down memory lane. Why not rekindle a fond memory with a friend. It's a great way to have a positive interaction with them. There are likely many more possibilities for using friendship pages as a business development tool for real estate. What ways do you see them being beneficial? And, what kinds of risks do you see with this new functionality? Let us know by leaving a comment. To view the friendship page, from the profile of one of your friends, select the the "View You and Friends Name" link that appears under their profile photo. That link will take you to the friendship page between the two of you which chronicles your wall posts, photos you are mutually tagged in, mutual friends, and mutual pages that you like. You also have the opportunity to view the friendship page between any two friends that you are connected to from this page by putting their names in the box at the top of the right hand column. When you hit "See Friendship" you are taken to the friendship page between these two friends. You must be friends with both people to see the friendship page between them. Looking to utilize Facebook for your real estate business development? Start by downloading Pixel Coaching's free 20 Point Profile Optimization Checklist.